Lot Detail - Martin Brodeur's 2012-13 New Jersey Devils "666th Win" Game-Worn Jersey with LOA - Photo-Matched! 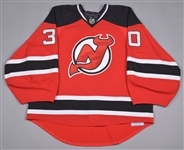 Martin Brodeur's 2012-13 New Jersey Devils "666th Win" Game-Worn Jersey with LOA - Photo-Matched! From his historic 666th NHL victory – fitting for a New Jersey Devil – we have the jersey legendary netminder Martin Brodeur wore accomplishing the feat, with this highly desirable example photo-matched. 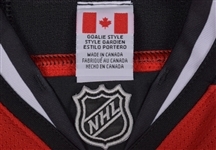 A March 23rd victory over the Panthers during the 2012-13 regular season, the important garment feature’s “Goalie Style” labeling along the collar including a “58+” size tag, with embroidered NHL and Reebok crests over the front and reverse necklines respectively. 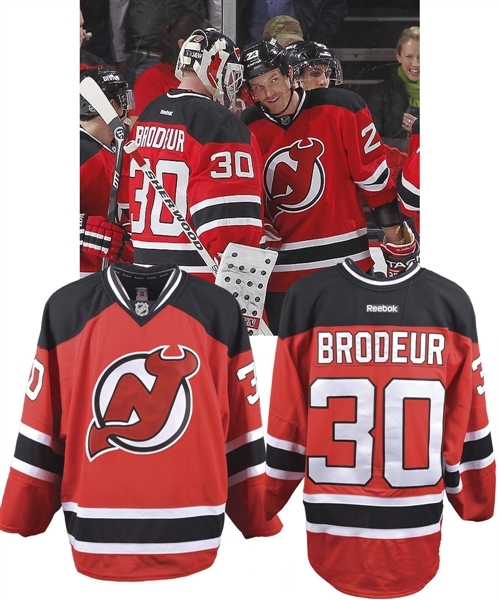 Styled with the familiar and attractive Devils team crest fully administered in layered tackle twill, the solid red V-neck has been accented with white oversized sleeve and verso numbers with black trim, with “Brodeur” across the affixed nameplate in matching material. A MeiGray patch numbered “H00747” has been placed over the inside hem, and according to their population report, the jersey is a "Red Set 2 - 666th Win". An LOA from the New Jersey Devils will accompany. In gorgeous condition exhibiting light use, a few dark marks are visible over the right sleeve, with a small stick mark near the team crest. Getty Images #164428219 and #164440146 (March 23rd 2013) have both been matched to the small black mark on the lower white stripe over the right sleeve (aligned with the "0" of "30"), while Getty Images #165300057 and #166410984 (April 1st 2013) have both been matched to the black mark on the top right area of the team crest. Next, Getty Image #164527178 from March 23rd has been matched to the loose white and black threads nearby one another on the right edge of the "0" of "30" on the left sleeve. Finally, Getty Image #165299908 (April 1st 2013) has been matched to the small black mark on the lower white stripe over the right sleeve (aligned with the "0" of "30"), and to the faint black mark two inches to the right.